Summer is on it's way and notoriously the busiest wedding season of all. Couples flock to the surf and sand in hopes of creating that magical setting the shore seems to offer. When I was in the process of planning my own wedding, we were on a very strict budget as most are. It was then my fiance and myself chose to do the invitations, favors and many other "wedding" items ourselves. This was a huge money saver... but not a time savor. Hand creations take time - but there is more love put into something you make than something you buy. People notice and appreciate this. I was searching and searching for ides for favors... coming up with the same "done-to-death" idea after another. That is when I went rummaging around my storage room... and since we were having an "Ocean" themed wedding... this was perfect. I had collected so much sea glass over the years (because of my jewelry biz) that I decided it would be great to use the glass in favors. I purchased glass bottles of different shapes and sizes and filled them with the shards I had collected. I had to return to the shores many times to collect smaller pieces as well... I had many bottles to fill - about 80 - so that meant many hours of beach combing. I enlisted my family in the hunt... and before I knew it, I had more than enough glass. Listed below are the materials and simple instructions on creating "Sea Glass in a Bottle" favors for your special day! 1. Glass bottles with cork stoppers: Can be purchased at a craft store for less than $1.00 per bottle. 2. Sea Glass: Beach comb for the glass if you are near the shore or you can purchase "faux" glass from craft stores, the Internet or Ebay, however, they should be small enough to fit in the opening of the bottles. 3. Glue: Any craft glue will do. Raffia: You can choose the plain tan or there are different color variations as well to choose from. 4. Avery business cards or thick card stock and cutter: Purchase these at your local office supply store in ivory or white. If you choose not to hand write them you will need a computer with a printer and visit the Avery web site to get the specifications of your business cards to design them or you can use Microsoft word and create a template. Also - as seen in the picture - I used a heavy card stock, and a scrapbook paper cutter to make the tags. To begin, print your tags out using which ever format you have decided upon. If you choose to make your tags from (as shown in my picture example) you will need to cut your card stock down to the desired lengths - stamp them each with a decorative stamp of your choice and write them out as you wish. Take your hole punch and punch one hole in each of the tags in the upper left or right hand corner. You should also pre-cut your raffia into desired lengths - long enough to tie a bow around the bottle neck. Next, you want to start filling the glass bottles with the sea glass. You might need to use a small funnel to make it easier if possible. Once all the bottles have been filled, place a ring of glue around the cork stoppers and place them back into the bottles. Now take your raffia and affix a tag to each bottle, finishing with a bow. You can even use recycled baskets or galvanized buckets to hold your favors in - also adding the the rustic seaside charm. You have just created your very own beautiful "Sea Glass in a Bottle" favors that will be timeless keepsakes for all of your wedding guests! What a brilliant idea. Using what you have at hand would be a great way to save much on your budget. 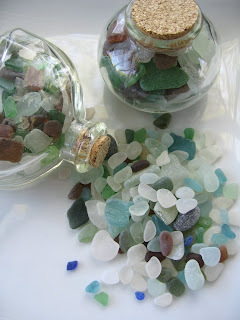 And sea glass in a bottle would be a perfect beach wedding favours.